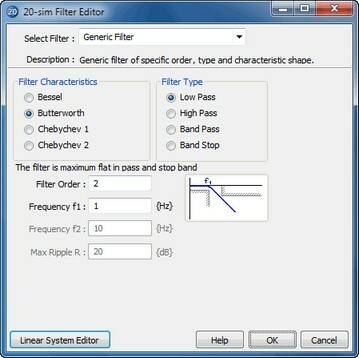 The Filter Editor of 20-sim allows you to create continuous-time filters and controllers. The result is a linear system presented in the Linear System Editor of 20-sim. The filter can also be applied to an existing linear system. You can open the Controller Design Editor from the Tools menu of the 20-sim Editor or by clicking Go Down on a Filter model. 1. Select a filter or controller of your choice from the list of available filters and controllers. A short description of the selected filter will be given in the description field. Depending on the filter that was chosen three or more parameters will be shown. 2. The second step is to fill in the desired parameters. 4. Select the Linear System Editor button to export the filter to the Linear System Editor. 5. Select the OK button to store the filter model on file or update the filter model in the Editor.